BAKER'S END 2: GOBBLEKNOLL HALL Review | Warped Factor - Words in the Key of Geek. Tony goes down to Gobbleknoll Hall. Baker’s End, the newish series of audio stories set in the world given half a twist that is the village of Happenstance, where someone called ‘Tom Baker’ lives, played in the audios by…erm…Tom Baker…is weird. Gloriously, unabashedly, in fact exultantly weird. As long as you know and embrace that single fact, you’ll have a whale of a time with them. If you don’t, if you try and enforce the rules of common sense or anything quite so depressing or mundane on them, you’ll quickly get the hump, so stop trying to do that immediately. The story so far: Tom Baker, veteran actor and one-time darling of the nation’s children when he starred as their favourite alien-bashing protector, died. Except, it seems, he may not have ever done anything so ordinary, as he then declared himself ‘reborn’ as both Tom Baker and the legendary ‘King of the Cats’ – a creature that looks astonishingly like Tom Baker in a cat costume, who now cavorts with goblins, speaks (if possible) even more rolling and glorious gibberish than ever before, and stops dark and eldritch forces that, for reasons entirely of their own, want to come to Happenstance and frankly lark about a bit. In the first story, The King of the Cats, Tom (Cat) Baker and his friend and former plucky TV companion, Suzie Goshawk (played splendiferously by Katie Manning), defeated the dark intent of Clacky the Dragon - and the Sinister Presence behind it. In Gobbleknoll Hall, the second story in the series, Tom and Suzie, along with Tom’s housekeeper, the ever-up-for-a-bit-of-screechy-possession Mrs Frimbly (Susan Jameson) get mixed up with a case of spooky shenanigans at the local stately pile in the middle of the dark wood, where creepy paintings, spiritual reunions, an unorthodox barbecue, possibly, but not conclusively goblins and a couple of long and not-so-long dead celebrities are aching to get back to the land of light and buttered toast. There’s actually some solid satire behind all this, as it looks at the culture of *cough, cough* ‘reality’ TV, and in particular the kind of reality TV that takes what’s probably a sincere and serious discipline – the search for evidence of paranormal oojamaflips – and turns it into badly lit, camera-fail, jump-scare telly for the staggeringly, not to say terrifyingly clueless. When a TV crew and a tame psychic with a funny name turn up to poke the spooks of Gobbleknoll Hall, they get more than they bargained for when a deeply-‘fluenced Mrs Frimbly starts consorting with the Sinister Presence and coming over all even-more-peculiar-than-usual, and Tom in his King of the Cats get-up and Suzie crash the séance. Diane Morgan as Marcella Doody (a riff on Britain’s ghost hunting presenter Yvette Fielding) and Stephen Critchlow as cut-price Derek Acorah, Brian Loughdick (Dicklove? Lovedick? Ohhh the hours of fun). The plots in the Baker’s End stories always have a certain manic, forceful determination to grab you by the scruff of the nonsense and pull you from the start to the finish, whether you understand a great deal along the way. There’s a level of wild exuberance in the language that you simply have to go with, or you’re going to want to throw Baker’s End far away from you. But if you can let the jabberwocking, ninky-nanky, slubberdegullion language of the at-least-marginally-fictionalised Tom Baker wash over you, it does something clever, and as such, remarkable – it creates the world of the fiction, a world that is ours, but given a deep colour-wash of dark, edge-of-reason fantasy, where goblins lurk and build book towers for the King of the Cats in a village called Happenstance, where make-believe dragons drive pensioners to distraction and scarecrow gods demand burnt offerings, and the ghosts of Gobbleknoll Hall are actually the least peculiar things and people (and in Happenstance, as Ford Prefect once perfectly put it, the things are also-people) you’ll encounter. When you consider the burden of origin story that the first episode had to carry, bringing Tom baker ‘back from the dead’ as Tom baker, King of the Cats, this second episode is actually slightly easier going in terms of its comedy, slightly more accessible than the tale of Clacky the Dragon was. Yes, Baker’s End is weird. But if it weren’t, you wouldn’t quite believe Tom Baker could be in it. Real life is weird too, it’s the only explanation that makes sense of him still, thankfully, being among us. Slung loosely through the weirdness though are moments of breathtaking poignancy that most actors would find especially affecting, but which, in all probability, Tom Baker takes more in his stride than any other creature on the planet. Magrs writes him scenes in Gobbleknoll Hall confronting his own mortality, his own glory days as a diamond in the Saturday-night lives of a nation of children, of a prime time many would say has passed. But Tom Baker’s an extraordinary individual. Things change, certainly, fortunes rise and fall. But perhaps, if you’re Tom Baker, or the King of Cats, or both, your prime time never passes, never fades, because you carry it with you in the very fibre of your being, and your legend too. Certainly, Baker makes those scenes some of the most raw and affecting in this story, but he leaves them with a tinge of power and pathos without ever feeling like they’re especially overplayed, or allowing them to drag the madness of the story down. Pick up Baker’s End 2, pop along to Gobbleknoll Hall, and have a linguistically mad, stylistically quirky time with the grooviest ghouls around. Revel in the distinct Tom Bakerishness of the language and the seeming freedom to unburden his full performance of himself that Paul Magrs gives him. There is a plot, and it makes some sense, and is also rather good fun, but the plot is by no means the main reason to follow Baker’s End. That’s the combination of Paul Magrs and the actual Tom Baker, creating this dark-washed, fairies-at-the-end-of-the-garden, scary-tale world of Happenstance, in which events all circle around Tom Baker, the King of Cats and his friends and not-friends. 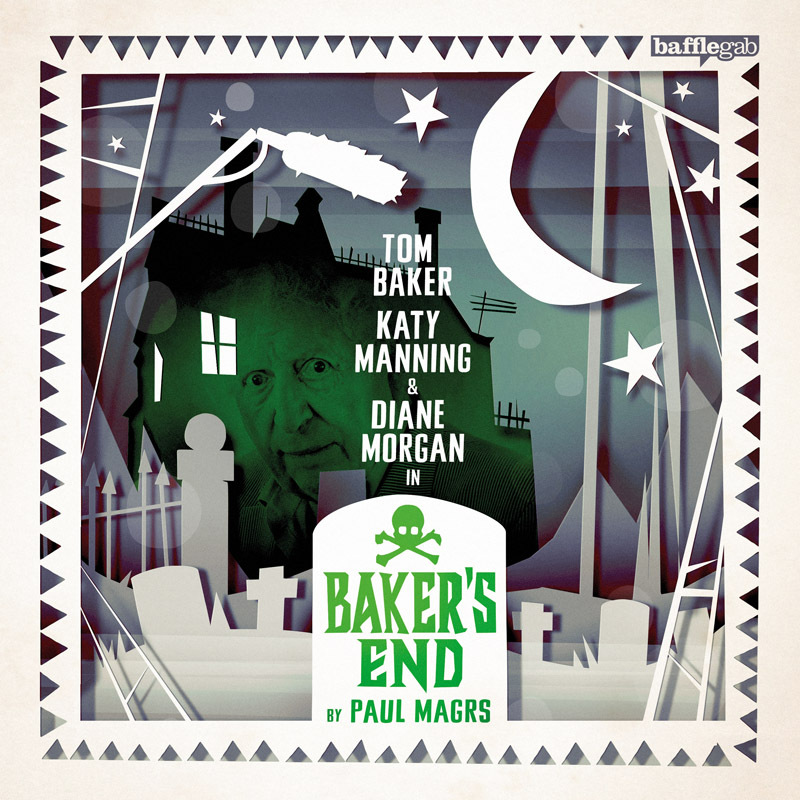 Like Alice and the Hatter in a Wonderland devised around the glorious peculiarities and pre-occupations of Tom Baker, Magrs and Baker together have created an alternative reality, that’s dark, bright, colourful and almost entirely loopy. You have to be in the right frame of mind to get the most out of Baker’s End (so to speak). If and when you are, Gobbleknoll Hall is a story that will fly by in a whirl of glorious madness and the flick of a tail.